'CLIMB GREEN' and earn your personal carbon credits towards your children's future! . Some parents invest thousands of dollars in education for their children. Help invest in saving the mountains and glaciers. Your children will want to follow your adventure spirit, and walk your path. We need to make sure there will be a path to follow. Peak Freaks has been trying to climb green for sometime but now with the worlds new knowledge and support, we are coming out of the green closet and spreading the world. This year we are sharing with the world alternative climbing practices for the Himalayas that can easily be implemented by everyone. You may have been hearing a lot about carbon offsets, or 'carbon credits', lately. They've become a must-have accessory for individuals and organizations who want to fight climate change and show their green credentials. Everyone from banks like HSBC, to rock bands like the Rolling Stones, to almost 500 NHL players are purchasing carbon offsets for their emissions. Climate change is a serious problem, caused primarily by the carbon dioxide released from burning fossil fuels like oil, coal, and gas. But there are things we can do about it that can help. Going carbon neutral is an easy way to take responsibility for the greenhouse gas emissions we create every time we drive our cars, take a plane, or turn on our computers. It's based on the principle that, since climate change is a global problem, an emission reduction made elsewhere has the same positive effect as one made locally. Here's how it works: if you add polluting emissions to the atmosphere, you can effectively subtract them by implementing a new system that will cut emissions with the result goal to reach zero which would be your personal goal. We understand it is difficult until we have more education and sources available to us to reach a total zero but if each item you currently pollute with is reduced by a fraction or all together we would begin to show a start and be responsible to the planet and our children. HOW DOES THAT WORK ON EVEREST ? The flight alone to Kathmandu and then on to Lukla the staging area of all expeditions has all of the climbers in debit to the planet in a carbon neutralizing world. . So we sat down and thought of ways we could credits and wish to encourage, or challenge other expeditions where possible to do the same. The joys of fresh, local and organic, free delivery too! country. It will be fresh and usually next to no packaging. 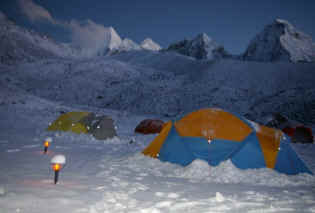 Some expeditions are carrying up to 11 tons of cargo to Nepal as quoted in one expeditions press release this spring. 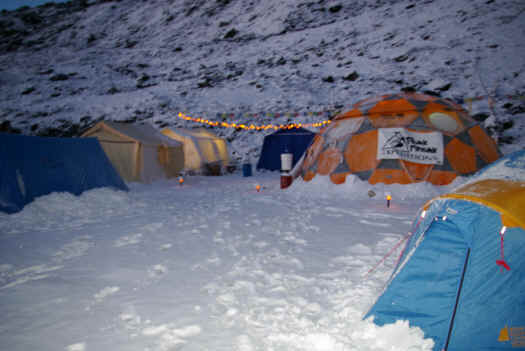 During the permit crisis this year with regards to Chinese pressure on Nepal issuing permits because of the Olympic Torch relay, some expeditions don't have access to their cargo because it is all held up in customs until the permits are granted. Our team members at Peak Freak's are on the go because we buy all our goods from the villagers and farmers in the valley. Why wouldn't you? Eat Organic: There is a ton of information out there today on this topic so I won't go into it. But I do want to say that we go that extra mile to try and provide it for our expeditions. After a couple of years of hunting for some organic boil in the bags we finally succeeded this year. We also use locally grown fresh organics. We didn't want to import anything but we needed sealed bags for the "on mountain meals" to be able to provide our climbers a balanced meal that doesn't take much energy to prepare. Boil in the bags offer a quick and simple heating process. This provides an easy to digest eat at altitude, eat out of the bag meal and there is no pot cleaning afterwards which would normally require more use of fuel. At the end of the day we calculate that this a worthy carbon neutral balance. This is the only food we import which is somewhat specialized. However, we have some ideas for next year so we won't be doing that anymore. A local idea too! We will share it with you when we get it all figured out. 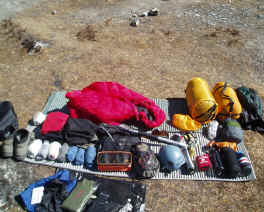 Less is better: When we heard that the Chinese may not allow communications equipment into Everest Base Camp this year. Tim and I both thought, "that works". Back to the way it used to be. About 15 years ago we brought a laptop to Lhakpa Sonam Sherpa who lives in the Everest region. At that time he was compiling sherpa summit history on Everest. All summit history was being compiled on western climbers. He did this because no one was keeping track of the Sherpas summit history. Lhakpa Sonam is deaf, he lost his hearing due to an illness when he was 14 years old. This piece of technology was the perfect gift for him. He spoke and wrote English well enough and was learning to type. In trade for us helping him he offered his assistance to keep Tim and I connected while he was guiding. Tim would hand write a note and send it down the trail with a porter to Lhakpa. Lhakpa would type it out and then walk his laptop down to the village square of Namche Bazaar where he could plug it in and email me the news to me. Lhakpa also quickly became the messenger for the Sherpa people who had family abroad. Life as it was before climbers started to bring "each their own" piece of equipment and for some, "pieces" of communication equipment. 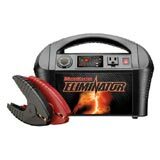 It is a "must have" today on most climbers list and their polluting generators that sometimes come along with it. Tim and I think it robs the climbers from the true mountain and spiritual experience, but that is the way it is today. All you need to climb. Add a pair of altitude boots, oxygen, pack and down suit and you are ready for Everest. never forget a trip in 2000 when things started to change. I walked into a lodge in the beautiful sherpa village of Kunde. There were several members from around the world staying here. A place that would normally be full of interesting conversation among climbers from around the world. Everyone sharing their personal goals and tales of their pasts and getting acquainted with the sherpa people in the village. Instead it was a room of complete silence, no one was talking and everyone was bent over a laptop computer oblivious to my arrival. Often climbers will find themselves in a situation where they have to sell their climb to sponsors to finance their climb on Everest. In turn the sponsor requires something of value which usually includes daily dispatches. It is not before long the climber learns that the deal was not as easy as they thought it would be while some quite like the publicity and some even do it for publicity. Whatever the case may be it doesn't take long for the climber to soon realize that it takes a lot of work and away from the climbing experience itself. Climbing mountains is mostly thought to be people that desire to explore in high places, learn and step outside of what is normal. Needles to say Tim is not a computer kind of guy and prefers to spend his time at base camp shaking some dice with the Sherpas or socializing around camp and those that follow him are happy they did. We agree that sat phones are a welcomed technology to let family members at home know you are safe and for emergencies. But for documenting your journal- a pen and paper would still do the trick and earn you would earn some carbon credits at the same time. Typical teahouse today using solar power. .
also solar. 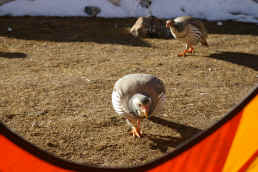 For heat during the day we have sky lights in our base camp tent but unfortunately we haven't found a way to keep everyone warm during the social time in the dinning tent so we use propane heaters. The good thing is that the climbers tend to go to bed very early at altitude, so it is not like it is blazing for hours on end. Cooking is another one that we have to use propane. The only way around this would be eating raw which is great, and even better for optimal health, but not at altitude. Your digestion needs all the help it can get at these extreme altitudes. LED Lights: Powered by solar. What a blessing. No more noisy lanterns, fumes and spillage of fuel on the trail. We have seen the effects on some of the older porters in the region who spent years of hauling kerosene up the valley dripping from plastic jugs on to their backs and legs and the environment. Then at the end of the day they huddle under a light in there stone homes around the stoves and lanterns breathing the fumes. 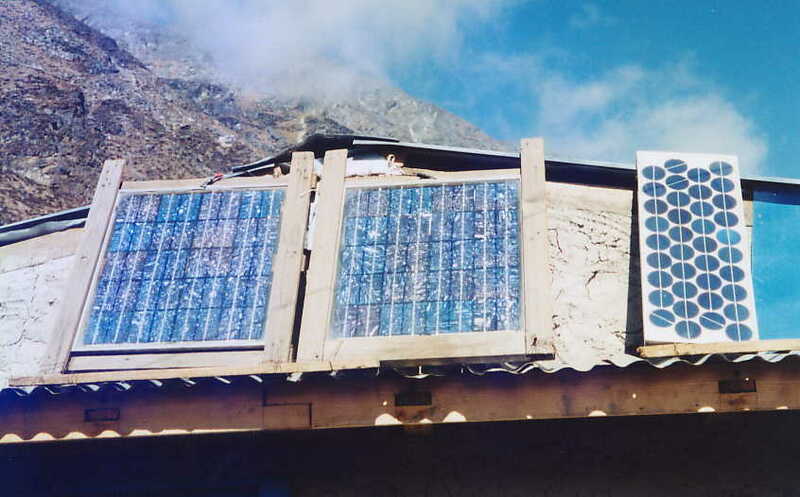 This invention of solar and now LED is a real true blessing to the health of the people and the planet. Every time we go up the valley we see more and more homes being lit up with clean quiet light. Check this light out! 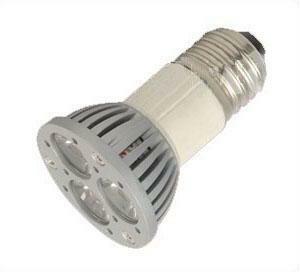 It has 3- 1 watt LED bulbs. Voltage is 100- 240AC. It can be stored at temperatures between -20c to -30c. It has 25 watts of light output and an expected life of more than 50,000 hours and it only consumes 3 watts of power. A couple of these works fantastic in our dinning tent. Combined with our outdoor solar lights makes for a nice cozy environment. Wind Turbine: Next year we were hoping to test wind power to see how feasible it would be. It was going to be next year because that is when we were slated to be climbing on the north side but that has all changed on us now due to situation with the Chinese and Tibet. We have made the decision to keep our expedition on the south side next year instead. The south side doesn't have the wind for wind turbines like the north would have. It could have worked. We have a couple ideas up our sleeves and anxiously wait for any input from our readers who may also have some ideas. COMPOSTING AND HUMAN WASTE: Not a scrap is wasted at Everest Base Camp's hostile environment. Anything that comes from any food source that we do not consume like potato peelings are fed to the yaks. At the end of the cycle everything will be returned to the potato and the yak benefits from that too! In the winter when there is no more grass to feed the yaks they are fed potatoes to hold them over till spring. It is a meat and potato kind of world up in the Everest region. Except the meat is not for eats this country where the religion is predominately Buddhism. Meat in this part of the world is used to save the backs of the porters in hoisting all the climbers cozy comforts up to base camp. AT BASE CAMP: We catch our human waste in plastic lined buckets complete with a comfortable toilet seat. To help neutralize the smell ,and help with the composting process, and add nutrient, we add our used coffee grounds each day. During certain times throughout the expedition porters are hired to carry the waste down the valley were it is spread out to dry and later tilled into the soil to grow more potatoes and fertilize the grazing fields for the yaks. ON THE MOUNTAIN WASTE: Human waste is thrown into the crevasse, out of sight out of mind! This is the hard one. 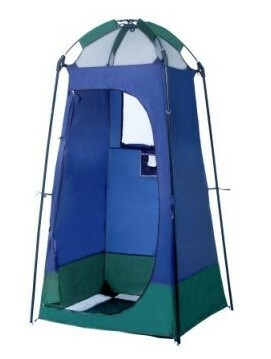 At Camp 2 on Everest expeditions bring toilet tents but the higher you go there are none, like Camp 3 and Camp 4. Some say it isn't a problem because your body starts to shut down by then and as a result you aren't consuming that much food and output of waste is minimal. Our concern is that with the increased numbers on Everest it could become the same undesirable mess that is growing on Mt. Ama Dablam, one of the most sought after climbing objectives in this region now next to Everest. We think it is time to consider stopping the free for all in the toilet department and seriously start introducing an alternative. We finally located some biodegradable plastic bags after looking for a couple of years. They are perfect for the clean up task. The idea is the climber will have their personal stash of bags to take up on the mountain and it will be brought down by them and added to the carry out compost collection. We will do this for sure on our next Everest Training climb on Mt. Pumori and Tim is assessing this situation for use on Everest this year and has bags in hand for everyone to get started. These bags are completely broken down in less than 40 days which was essential in order to be used without adding another pollution problem to the fields (like plastic) and for health reasons. We had to find biodegradable ones and we finally did. Check out the photo of the ECO Film bag above. 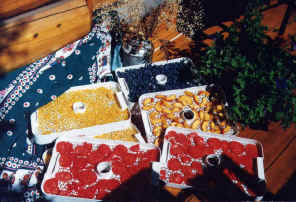 GROW A GARDEN: Make your own snacks, dried fruits without added sugar and tomatoes spiced up are not only light weight, natural and organic, but they also come without excessive packing and preservatives. PHOTO: These are some of our snacks we grow at home. YOUR IDEAS PLEASE! We are looking for your help! Any ideas or direction would be greatly appreciated. Today many companies tout being ECO vacations, or ECO friendly, or paying into a fund that allows them to use a logo that says ECO. But it doesn't seem anyone is actually spelling out just exactly what it is they are doing. We encourage everyone to start sharing their knowledge. What are you doing in the mountains? GO TO MT. EVEREST EXPEDITION IN PROGRESS NOW!